I am looking for a sample code for triggering an event which can print the contents of a Table A to a printer and then also load the rows printed into a archive table say Table B and delete the rows in the table A when both the functions are complete. Example : There is a scan data being loaded to Table A. There will be a column which can have a flag say Print - Y to dynamically control after how many rows the content needs to be printed. For example saw a 20th row being inserted into the table A and the column print has Y then it should send these 20 rows (PDF preferable) to printer and then insert these 20 rows into an history table B and delete the 20 rows from table A. Then new data starts trickling in. Or this could be done only with an SSIS job? If so any specific functions in the SSIS package? SSIS is may not be the better solution cause your just doing CRUD... Write a SQL Server stored procedure and use SQL Server jobs. how can i create after insert trigger when i used multiple tables every table connected with another table. you can insert one table data in multiple tables...such type of case you may need to create a sp and slq job. Suppose multiple clients send the insert data command simultaneously. What would happen in that case ? Do all request fire separate triggers or one instance of a trigger handle all requests coming in at same time ? Well, When you connect to SQL server database engine, the sql server create a session for you as well as for every connection, I hope you understand. i have a two database like testDB and testDB1. 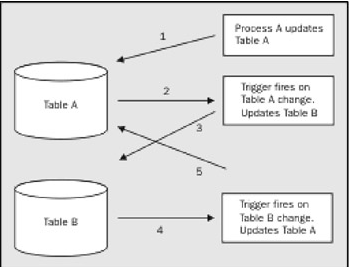 both DB table names like table for testDB and table1 for testDB1 and field name also same for both tables. Well, I don't think the way your are trying to use a trigger is good. For example if your issues is after restoring database you want to update & sync with the another one then SQL jobs / DTS might be a good solution. This is nice. I have started writing article on Trigger with details but some how I didn't get time to complete it. I am giving you the TOC of that Article, Hope this will help you update this article to move it to next step.